What Drives Successful Marketing Campaigns? If your goal is to reach viral status, then you’ll need luck on your side. But launching successful marketing campaigns doesn’t require a four-leaf clover. Success doesn’t happen by accident. It’s a result of a well-planned, well-timed and well-executed strategy. It’s not serendipity but rather a culmination of hard work and innovative thinking that turns an idea into a successful marketing campaign. Don’t let that overwhelm you. If you’re bored by the status quo, then use these tips and examples to help transform your outreach strategy. Successful marketing campaigns start as an idea. In the early stages of your brainstorming, there’s no such thing as a bad idea. Throw everything out on the table and see what resonates with your team. Remember that brainstorming should be a fluid experience. Don’t overcomplicate things or stifle creativity by imposing a lot of structure on this process. But once you do have a viable selection of ideas, your best course of action is to keep them organized by using an editorial calendar or Google Docs. Make it easy for team members to continue suggesting new ideas or adding feedback around existing ones. A Trello board, for example, is a great way to promote team collaboration and engagement around specific projects. By keeping your ideas organized, you’re able to easily sort through everything and determine the best course of action for each one. Plus, you’ll have a nice reserve for future marketing campaigns. When coming up with ideas for marketing campaigns your target audience should be top of mind. Everything you put out on social media and other marketing mediums should resonate with that specific group. An idea might sound brilliant, but if it doesn’t fit well with your target audience, then it’s not going to be successful. Before your brainstorm, you need to know who you’re targeting. You shouldn’t build a target audience around an idea, but rather build an idea around your target audience. You’ll also want to research the social media demographics of the platforms you’ll be using during the campaign. Where is your target audience active, and do you have an established presence there? Launching a marketing campaign on a platform where only a small portion of your target audience is active isn’t a very efficient strategy. Dig into social network demographics to be sure your campaign will reach a majority of your desired targets. This is one of the easiest ways to ensure a successful outcome. Totino’s executed this perfectly with its “Bucking Couch Bowl” campaign on Super Bowl Sunday. The pizza rolls brand is popular among younger demographics and Twitch, a well-known video video game streaming site, is home to numerous 18- to 34-year-old website vistors. What better place for a video game competition atop a moving couch? Additionally, consider topics that are popular among your target audience. You never want to be manipulative with your social media marketing strategy, so tailor your campaign as much as possible to the interests and needs of your customer base. Is there a need that you can address? Are the same questions showing up in customer support emails or blog comments? If so, work them into your campaign or even build a campaign around them. If you’re giving people what they want, they’re less likely to feel like they’re being marketed to and more likely to feel like they’re part of a conversation. What does success look like to you? While it’s important to know who you’re targeting, it’s also critical to know what you expect to get out of the campaign. Do you want to attract new customers? Increase downloads? Whatever your objective is, dig deep. How many new leads or downloads do you want to get? By clearly defining what it is you’re hoping to achieve and setting specific goals, you’re better able to measure success. Once clear objectives are determined, you need to decide which metrics you’ll use to track them. Since many, if not most, of your marketing campaigns will take place on social media, familiarize yourself with the metrics that are worth tracking. We also encourage you to learn more about defining and measuring your goals with our guide to measuring social media ROI. If you’re looking for even more analytics to help define and measure your campaign, try Sprout Social for free with a 30-day trial! You might not have a brilliant idea right now, and that’s okay. Sometimes you need a little inspiration. Let’s look at a few key takeaways from some of our favorite marketing campaigns. Although you shouldn’t copy another brand’s campaign, check out the key elements that can be incorporated into your marketing initiatives. It never hurts to see what it takes to make successful marketing campaigns and then use those qualities in your own. This isn’t Old Spice’s first mention for brilliant marketing campaigns, and it likely won’t be its last. The brand’s “The Man Your Man Could Smell Like” campaign may be six years old, but it was so successful that it’s still inspiring campaigns today. Back in 2010, Old Spice launched its campaign which was originally designed to promote a body wash. The 33-second video, which depicts a shirtless Isaiah Mustafa addressing viewers in rapid-fire monologues, was watched almost 6 million times in the first day alone. The campaign was quickly expanded to include other products, and even led to a follow-up campaign based on user feedback. Mustafa ended up recording 186 videos responding to Tweets and Facebook posts from Old Spice fans. That campaign resulted in a huge spike in social media influence for Old Spice. The brand increased its Twitter followers by 2,700% over a two-day period, its website saw a 300% increase in traffic and campaign impressions reached 1.4 billion. At the time, Old Spice had done something that hadn’t been done before on social media. It took something as boring as a personal hygiene product and turned it into a quirky yet memorable marketing campaign. The initial video ads were fantastic, but it was the video responses, in our opinion, that gave this campaign its edge. Social media was often touted as a way to connect with customers, and these videos proved that use case. 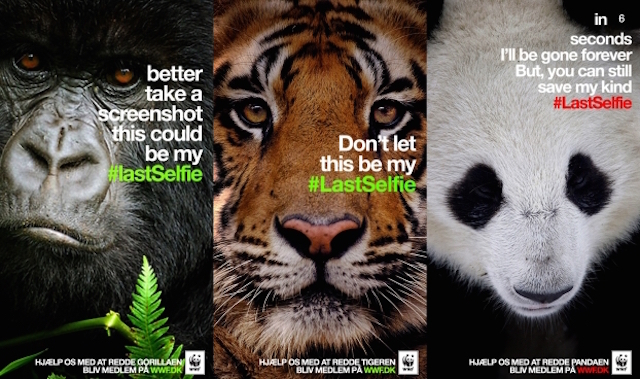 The World Wildlife Federation’s “Last Selfie” campaign played on emotions and was brilliantly executed. Wanting to reach millennials, it turned to Snapchat to raise awareness for endangered animals through selfies. This is fascinating for a couple of reasons. Brands work selfies into marketing campaigns quite often, but it’s unique to see something so often considered to be self-centered used in such a selfless way. The platform was genius. The decision to use Snapchat wasn’t based on demographics alone. Designed around time-sensitive content, the platform was the perfect choice for stressing how little time these endangered species have left. On the first day of the campaign, the WWF saw 40,000 shares globally. Within a week, WWFs in different countries began localizing the campaign for their respective regions. The campaign was a huge success and the organization was able to collect its monthly donation goal in just three days. More recently Burt’s Bees, no stranger to compelling marketing strategies, took a similar approach with its “Bring Back the Bees” campaign. The campaign encourages followers to help bring back the disappearing honey bees by removing the letter “b” from their Tweets or by purchasing a limited edition lip balm. In return, the brand will plant 1,000 wildflowers for each person who participates. The goal of the campaign, which runs until June 30th, is to plant 1 billion wildflowers. As of writing this, 121.6 million wildflowers have been pledged. Building emotional connections with your followers is important. Emotions are powerful drivers of actions. Happiness, for example, is one of the main catalysts of social media sharing according to psychologists. And sadness, while not something you want to invoke often, was actually found to promote connection and empathy. Obviously don’t manipulate viewers into taking action by toying with their emotions, but a genuine campaign that tugs at the heartstrings can be a success. Launching successful marketing campaigns is easier when you have an easily sellable product, but “unsexy” products—like auto insurance—can be more of a challenge. Despite this, brands like Progressive have found success through humor and its perky spokesperson, Flo. While not a marketing campaign per se, Flo has been a consistent piece of Progressive’s evolving marketing strategy for years. Selling car insurance is dull, and the idea of engaging with insurance companies makes some people cringe. Progressive found a way to humanize its brand and that is what’s driving its marketing success. Flo’s commercials and social media presence are fun, whimsical and pull in viewer engagement. Her Facebook Page has more than 5 million fans. This recent post, which makes no mention of the company’s product at all, received more than 6,660 views, 160 reactions, 43 shares and 15 comments. Post by Flo, the Progressive Girl. You might not be aware of your current policy details or even thinking about switching your insurance, but you do know Flo. And Progressive is counting on your connection with her (and therefore the brand) to convince you to consider it when you’re ready to start looking at other car insurance options. Coming up with ideas and launching campaigns is the fun part. But just because your campaign is live doesn’t mean your work is over. You need an exit strategy. What do you plan to do with the leads or downloads you get as a result? You may have met your goals, but if you don’t have a plan for what comes next then it wasn’t a true success. And if you didn’t reach your objectives, what could you have done differently? Are there elements you’ll keep for future campaigns? Review each campaign with your team and see how you can improve the next one and the next one after that. Additionally, consider the marketing campaigns that have caught your eye both as a marketer and a consumer. What did you like about them? Was there something you didn’t like? Use this information in your next brainstorm!